Gabe Evens is the Assistant Professor of Jazz Piano, Composition and Arranging at the University of Louisville, Jamey Aebersold Jazz Studies Program. Evens is a certified teacher of the Alexander Technique, and holds an MA in Jazz Piano Performance from the University of Miami, and a DMA in Performance major, in Jazz studies (composition emphasis) from the University of North Texas. He has recently released a trio album entitled, The Wrong Waltz with Lynn Seaton on acoustic bass and Ed Soph on drums. The album presents 10 original Evens compositions and is a gem of modern trio playing. The wide variety of styles reflects a deep knowledge of the jazz trio tradition, from bebop, hard-bop, fusion, to modal. The music is lyrical, takes unexpected twists and turns, conveys a strong mood, and feels great. 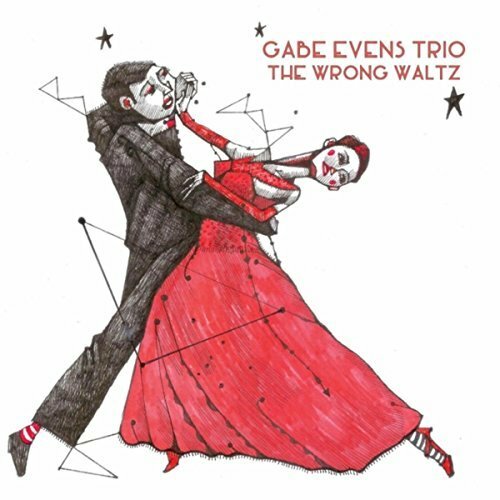 The title track finds the trio effortlessly negotiating Evens waltz timed melody. The trio has a buoyancy and interaction that is straight form the Bill Evans lineage. Soph’s brush work is excellent during Seaton’s bass solo, giving rhythmic propulsion while allowing Seaton’s crafty lines to be heard while still being supported. Evens’ solo builds in both melodic complexity and register. His lines are clear and accented with well-placed left hand chordal accents. The interaction between Evens and Seaton is a harmonic and melodic conversation that will keep you entertained and smiling. The trio gets into full hard swing mode for “Loud, Quiet, Loud in Blue.” This melody has everything: strong memorable lines, nice band hits, interesting form and a swinging rhythm that kills! Seaton unsheathes his bow for his solo with good effect. Nice upper register playing, and he adds a tone of personality in his bow ornaments and effects. Again, the conversation between Evens and Seaton is excellent. Evens solo swings so hard that you will want to clear a space to move, because something is going to be a’ boppin’. This is a fun track that shows the trio’s playful side. A swinging date that keeps the flow nicely, with compelling originals and solid interaction between the players for a swinging good time.